I have recently had to change my blog to the new platform for blogger. I found I had quite a few hits, somewhere around 4.5k. I found this kind of shocking, though I know quite a lot are probably me I still wouldn't really have guesstimated a number over 500 or so. It got me thinking about whether it's worth still updating this now and then, even though my SNE chase is over. It doesn't really take long, so why not? 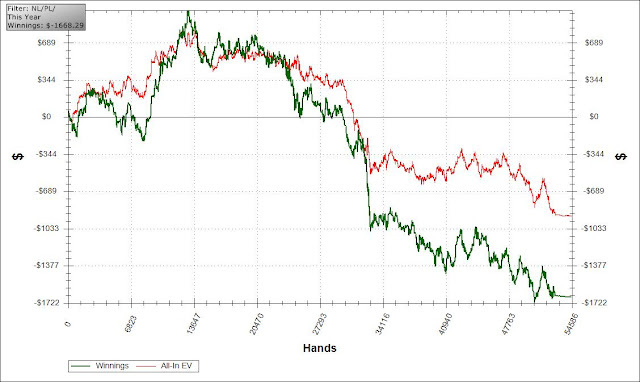 Thanks guys and gl at the tables! Anyway I'll try to provide at least a couple more updates before year's end. I still might be going for SNE again next year in which case I'll update a fair bit again in 2013 (maybe each month or something). So I've been meaning to do this final update since the Stars meeting. Since then I have just been busy with other stuff and putting this off. While this blog was done first and foremost for myself to stay motivated, I really hope that at least someone finds this blog useful in evaluating whether to push for SNE or other high volume programs. 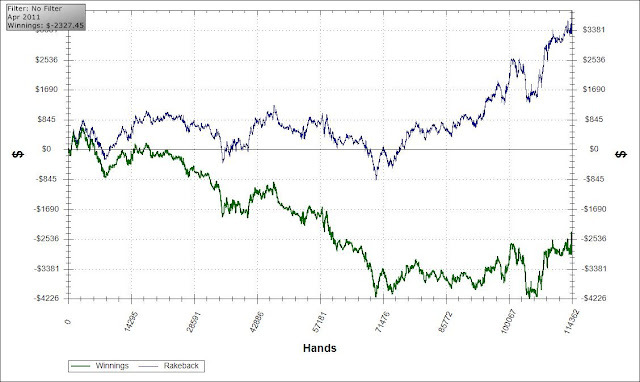 Now, without further ado, on with the epic recap (scroll to bottom to see year graphs)! Looking back, I'm still not sure exactly what to think about January. Did I play terribly but run amazing? Or did the fact that I was so fresh and thus my mind was working so much quicker than in later months make up for a lot of my errors. Probably there is a little truth to both. Either way, it wasn't a bad way to start the year. This was probably one of my slacker months, and to be fair I probably wasn't playing very well for a lot of it. On the other hand the second month was pretty crucial in terms of keeping momentum going as I figured there was a decent chance I would have been over it by then. I think this was one of the months I ran pretty disgustingly bad in LHE, but it happens and I managed to push through it. I think this was also the month where things started to fall apart and I was playing less and less, eventually falling behind pace. 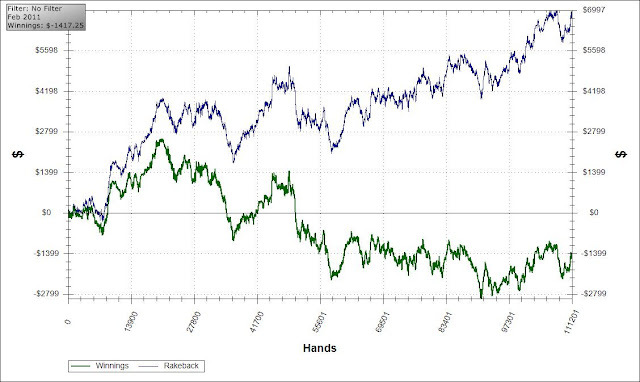 This was my second month in a row just running ridiculously badly at LHE and playing less and less because of it. 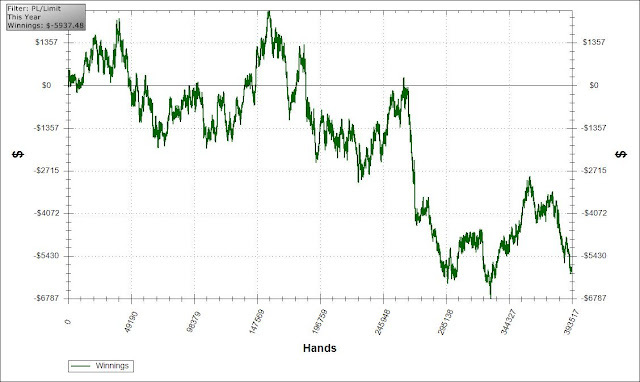 It's funny though looking back, even though I'm likely a whole lot of BB's under expectation, its less than a year ago and now I wouldn't bat an eye to run this much (in $) under aiev or lose this much in a day. In fact I lost more last night than I did in this whole month and didn't even think about it. 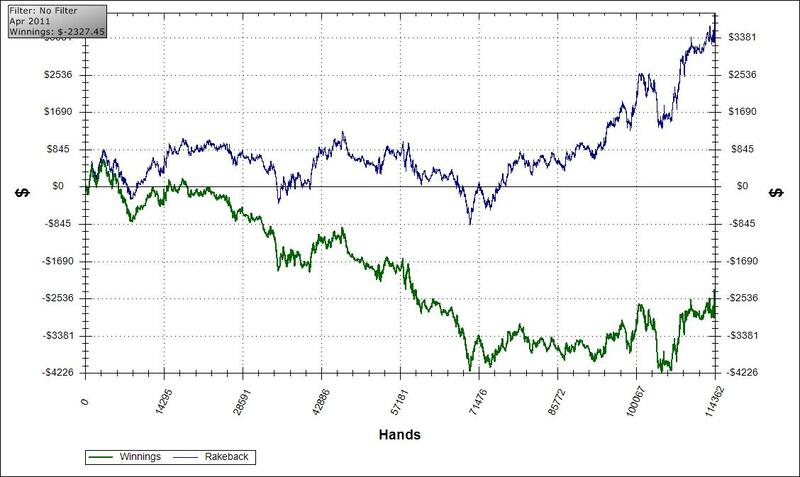 Yet back then it tilted me enough to reduce my playing amount. 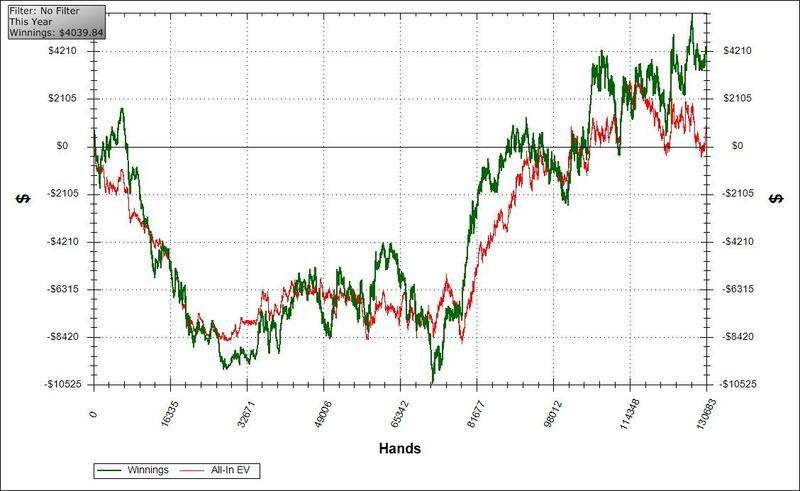 I actually made the switch to PLO for the latter part of this month and ran pretty good to make up for it given I was certainly a losing player back then. 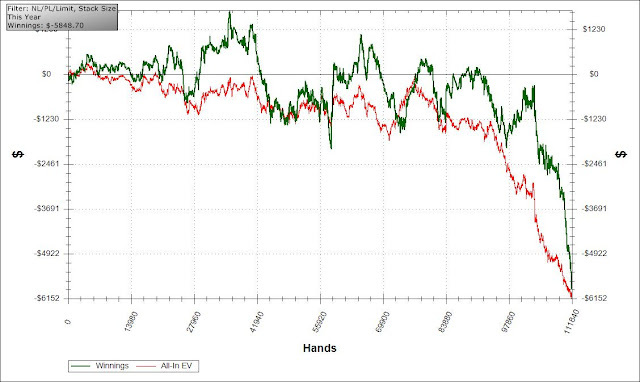 This was my first month fully at PLO after making the switch, and looking back at how badly I was playing back then I must have been running pretty good. 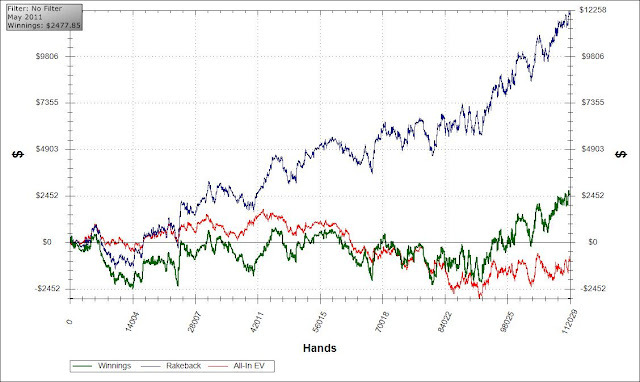 I tend to think I've always run really well when I've needed to in poker, such as starting a new game, and this was no exception. I moved home in this month in preparation for moving city, and barely played for a lot of it. When I did play though I ran perma-godlike, which was great as it took away any stress I may otherwise have had and allowed things to all go smoothly. This was the month where I really started to get way behind pace. My only losing month (post-rb) for the year and I really had it coming. Switching to a totally new game halfway through the year and expecting to masstable and win meant that this month was inevitable; it just came a little later than expected due to my initial rungood. I also continued to fall behind pace due to wanting to spend my last weeks in Melbourne with friends and family as much as possible. I finally moved city in August, and was met in Brisbane with constant internet issues. I also spent a lot of the month trying to work on my game, furnishing my new place, and getting worried about how far I was falling behind pace. All these issues meant I probably didn't play my A-game much, so I can't really be too disappointed with my very mediocre result. 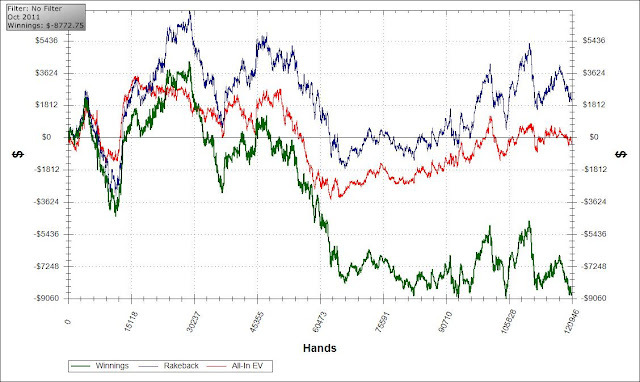 While my results weren't great in September, I definitely think that this month was my turning point in plo. 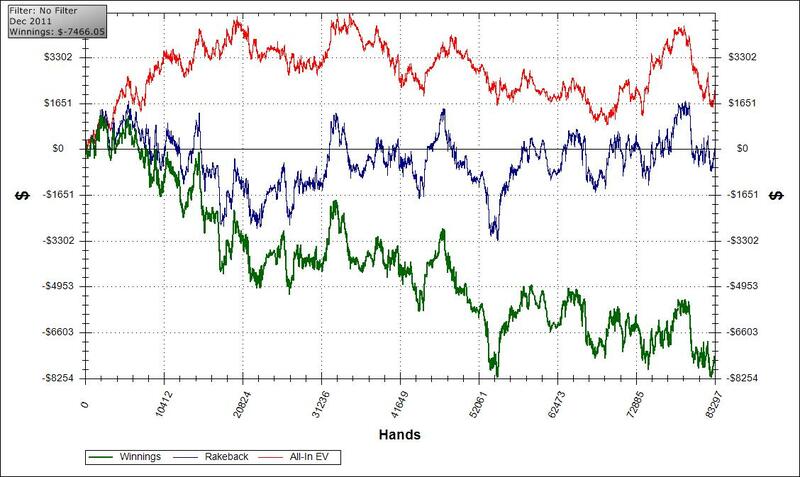 I dropped down stakes, grinded hard, worked on my game, and it is reflected in running pretty much breakeven in aiev for my latter 70k hands or so. 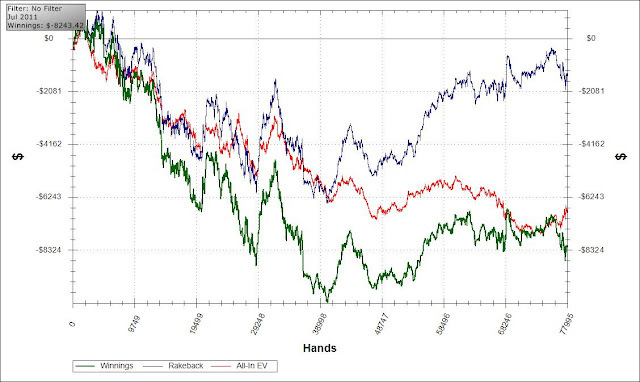 Unfortunately, as often seems to be the way in poker, the second I started applying myself and playing better, I started running worse and worse. 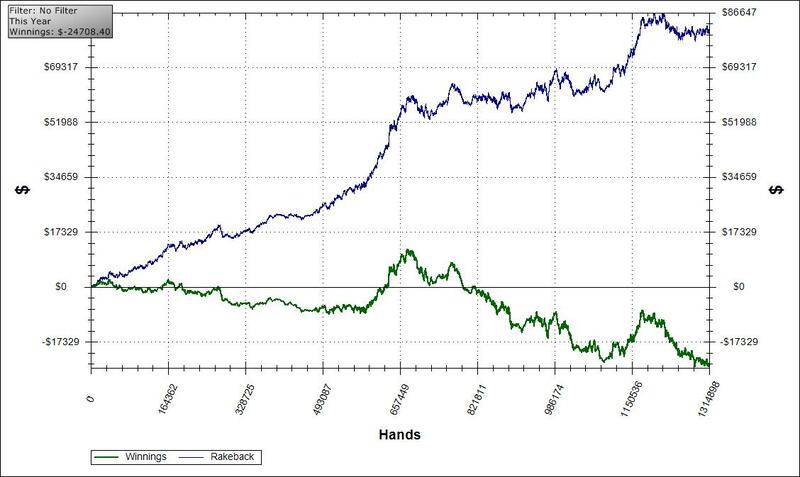 This month really shows what it is to be a rb plo player. It's just so easy to run 50 bi under aiev in a short sample, and while I may be biased I think I ran considerably more than 50 bi under true expectation here. 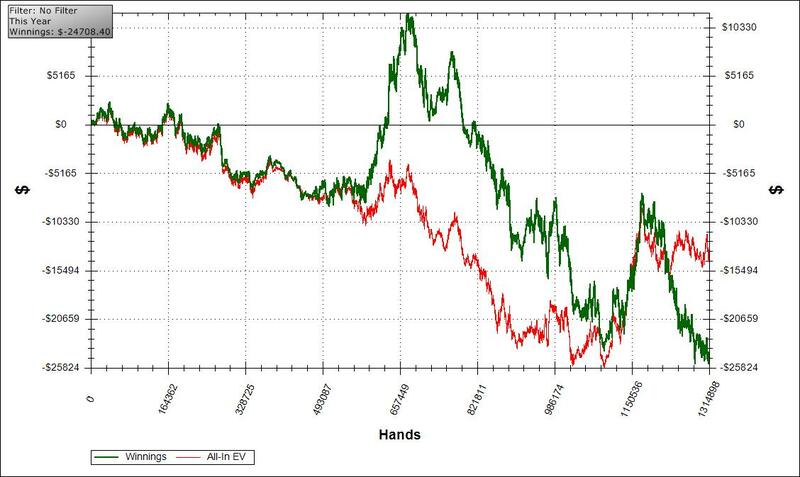 On the other hand this month also gave me a lot of confidence in my plo game as despite running terribly in cooler spots, playing a decent amount of hands, and running way under aiev, I managed to put in an aiev profit. 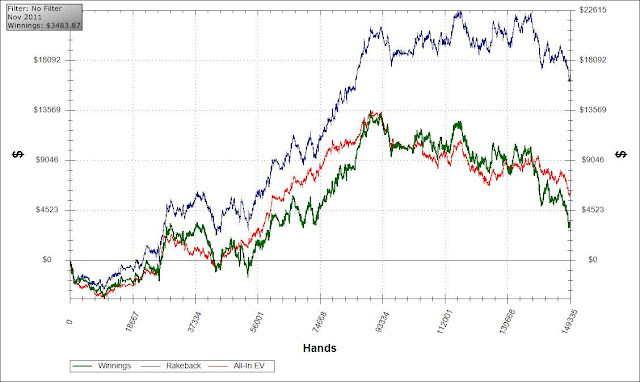 This was my crazy and SNE-defining month. Knowing I had a holiday booked in December that I wanted to be done by, and Stars giving a high play promo meant I had a bunch of absolutely insane days. I definitely wasn't playing anywhere near my A-game but picked up a bit of $$ hitting the promo leaderboard a few times to make up for my table losses. Finishing the month back ahead of pace finally meant I finally knew for sure I was going to make it. 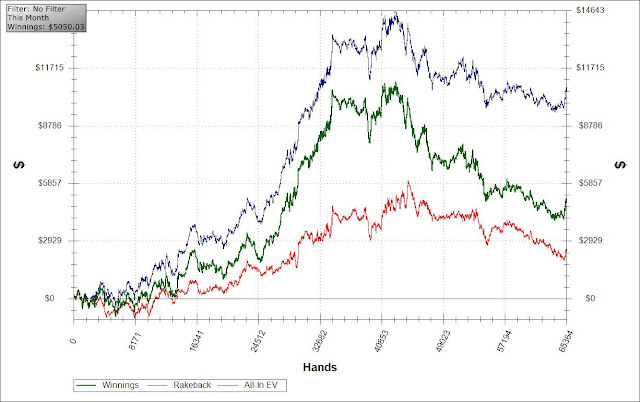 My final month involved running badly but not caring too much. It wasn't a tough month in terms of volume and led in well to my holiday. Definitely felt good to be done. 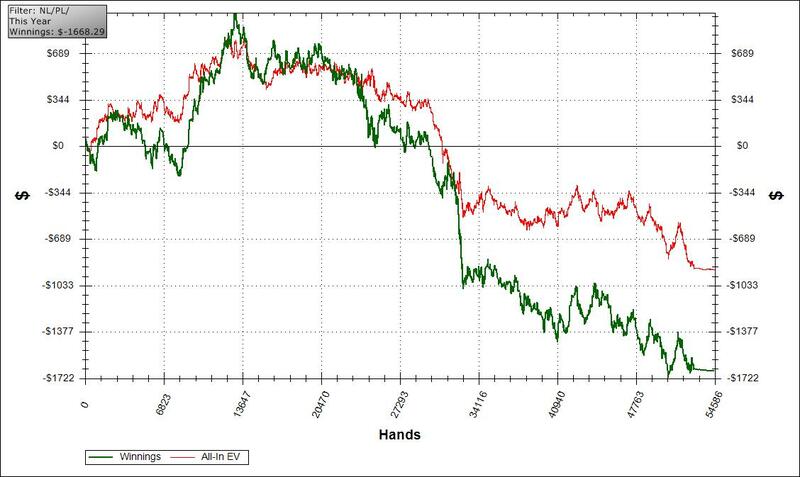 The game I started of the year playing, I definitely feel I ran ridiculously bad for a lot of this, particularly at higher stakes, but at the end of the day it doesn't even matter any more. I barely even played enough hands to be worth posting this in the end, but I did plan to play it at the start of the year so meh. There is definitely a fair bit of tilt in this. I remember thinking about how badly I was running. It's pretty lol now looking back. There is no question one of the best decisions I made this year was to stop playing this stupid game haha. I just never worked hard enough to get good and just used it to reduce variance while keeping vpps ticking over really. I ended up roughly breakeven in aiev, which I guess I'm happy with given I took on a new game masstabling, learnt as I went, and had a few periods playing well under my A-game for various reasons. 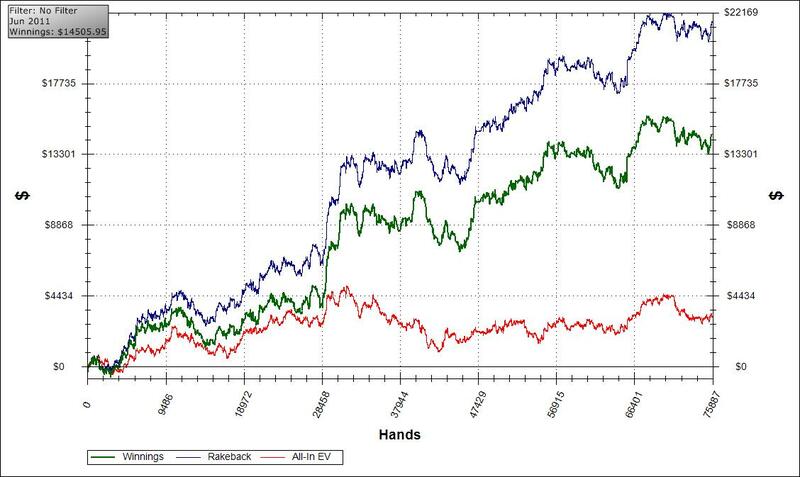 As a repeat SNE, breaking even in PLO can earn me a decent amount. and finally, my totals for the year. I don't think the totals are perfect, and there is also all the bonus $ and leaderboard money, which I believe was about an extra ~$2k or so. I also managed to have a positive tournament year in the very few I did play, for probably another +$500. 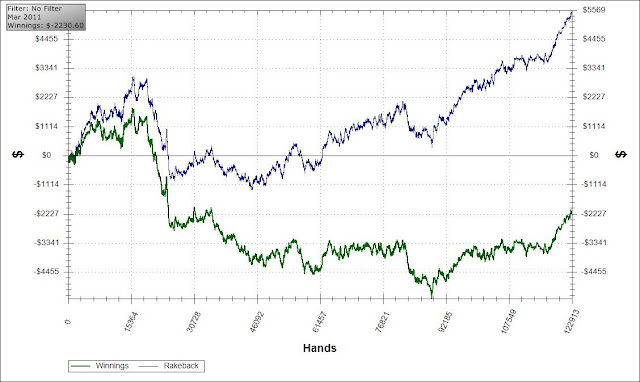 Long story short I think I made a little bit more than these graphs suggest. I didn't really get close to finishing in the end. 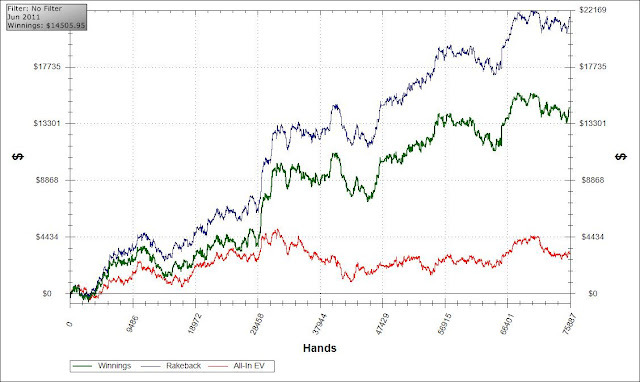 Had a big losing day to start off the week and decided to just slow down my pace as I believe I can still afford it. Just 5.7k left now though, so still excited to finish. Pokerwise I ran another 20 buyins under ev so I think I may come close to cracking a 150 buyins under aiev streak by year's end if I continue this current trend for the next couple of days. It definitely feels really good to be just losing virtually every all in hand regardless of equity and yet still keep my head together and play the next hand just as well. Testing and improving mental strength isn't an opportunity you get by running good, so in many ways I can be thankful for it, especially when it's only over relatively small amounts of money in the longterm. 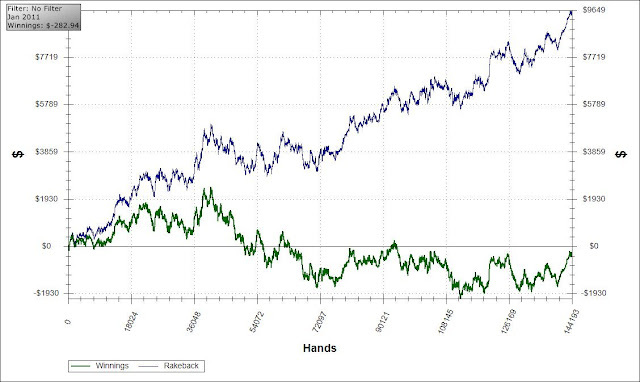 I'm spending a lot of time thinking about what I want out of next year and how much I want poker to be a part of it. 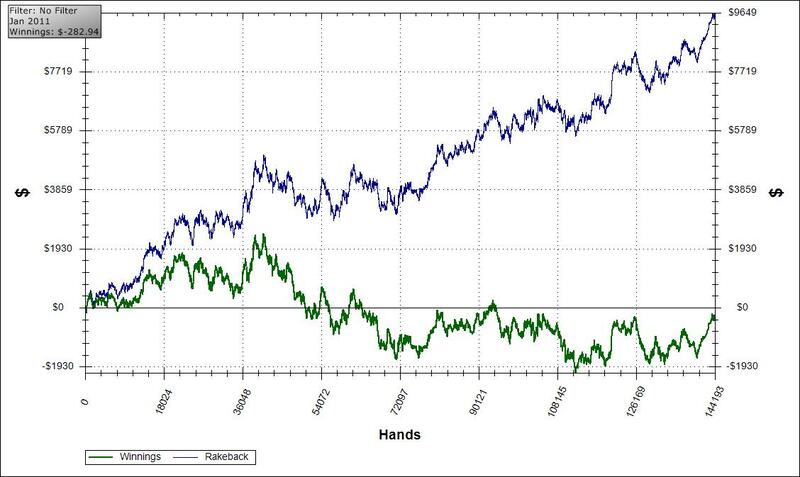 It looks likely I'll end up making ~$81.5k before finishing in 2011. On the one hand that's not a bad salary and it's hard to complain financially, but on the other hand I feel I'm sacrificing a lot to get it, and at my current age I'm not sure it's worth it. 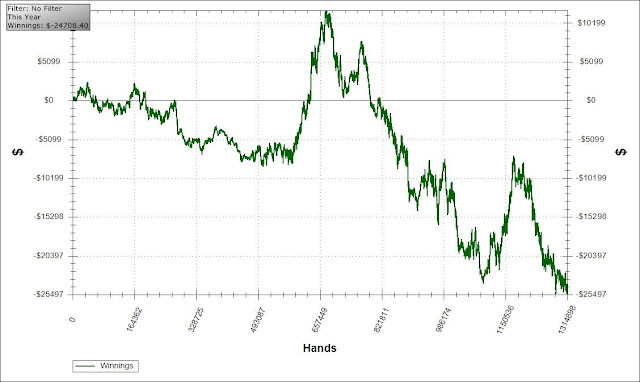 My other issue which is quite large is that next year my winrate in aiev has been really solid for my last 200k hands or so, and my reward for sne skyrockets in the second year as well; so if I don't go for it I'm potentially turning down a lot of money. I guess I'll make that decision over Christmas. Second last blog update for the year? I sure hope so. Finally bit the bullet and booked my flights out of Brisbane on Christmas Eve. This means I won't have internet after that point and must be finished before I go. Outside of things out of my control I can't see it being a problem though. I'm not going to lie, poker is definitely really painful at the moment. I wake up just wanting to do absolutely anything other than play hands. Every downswing is causing me stress as at this point I've already basically checked out for the year and am just desperate to finish. Vpp wise I have just under 30k to go. That's five 6k days, or six 5k days, or seven and a bit 4k days, or ten 3k days. Haha. It's all that is going through my mind right now. I just pray I'm done by this time next week. I finally managed to crack 100 buyins under ev since the end of July as well, which is a pretty cool story I guess. 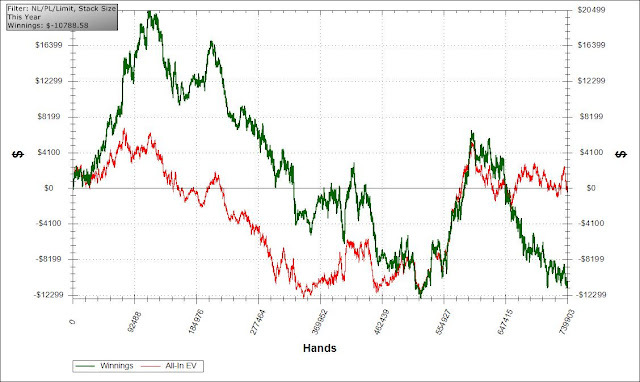 On the plus side, removing the days when I was playing 8k+ hands/day for prizes, I've actually managed around 20ptbb/100 in aiev for the last 120k hands or so, since I last changed up my game in a big way. So at this point I definitely have the confidence that I'm at least a winning player. VPP wise the process is simple. I need 14 4k days to hit SNE and be done. That's the next two weeks and I really hope I can be done with this by December 20. 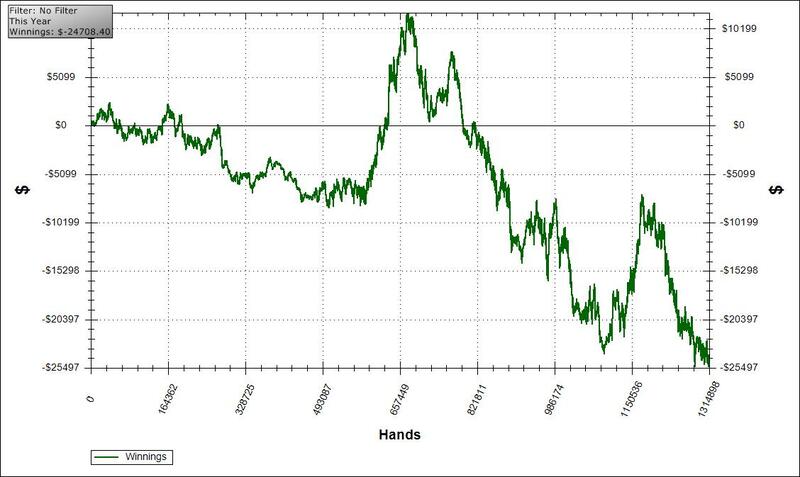 The intense grinding I did at the end of November has really taken a lot of the pressure off and I feel very confident now about hitting SNE by Christmas Eve. 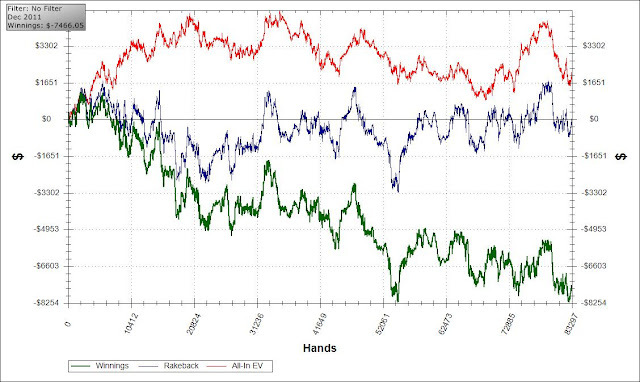 One thing has really gotten me thinking lately as I play more and more plo. 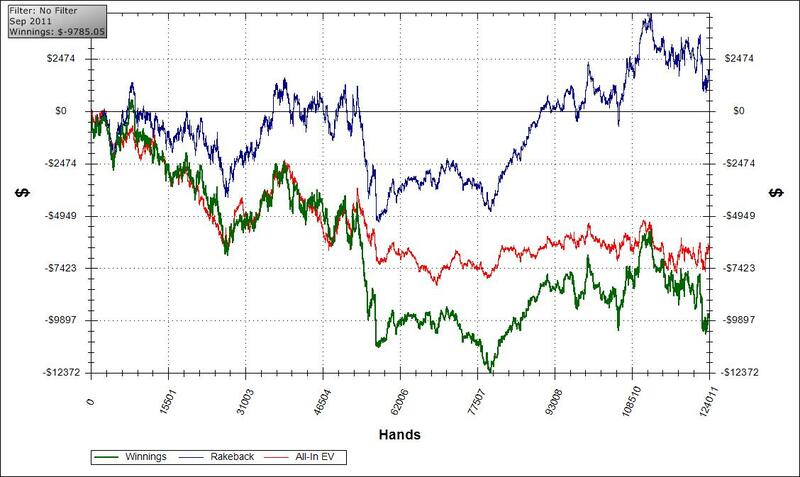 Back when I was playing lhe, people would ask me if poker was risky gambling, and I would always with absolute confidence be able to answer absolutely not. The only real risks as a lhe player were having games dry up or sites shut down and take your money, and the biggest downswing a winning player could realistically have was only about 1000BB or so. I don't feel that confidence in ploplo. I mean the lines for winnings and the lines for aiev just don't correlate at all, and even aiev represents such a tiny part of the luck in this game. It also has me thinking a lot about the role of advice. 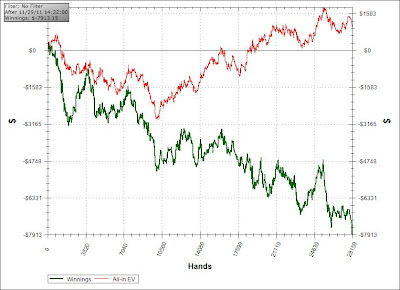 As far as I know there are really two schools of thought on poker. The first, which is thought by probably a majority of laymen, is that poker is for the most part a game of luck. If you just assume all thinking, solid preflop players are close to equal, and take 1000 of these players, you will get a set of results created purely at random chance. The top 5-10 players in terms of luck get to become the experts that can coach and create training sites and everyone tries to emulate and look up to. 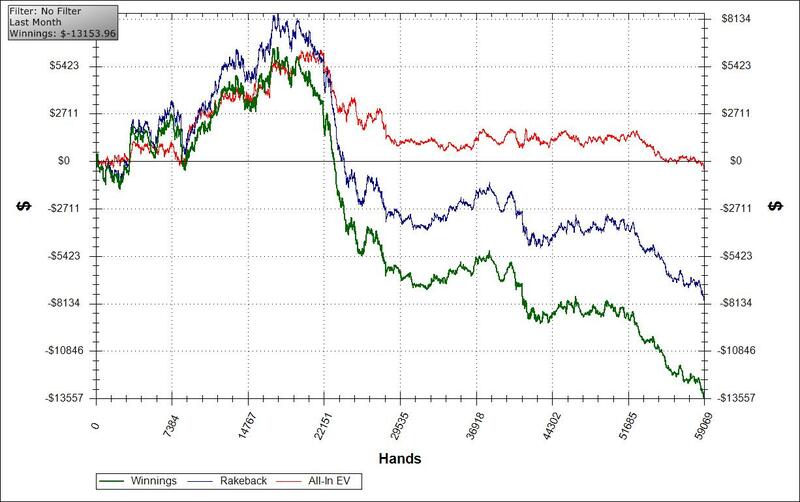 The bottom 100 or so players in terms of luck are the regfish that are making so many mistakes. 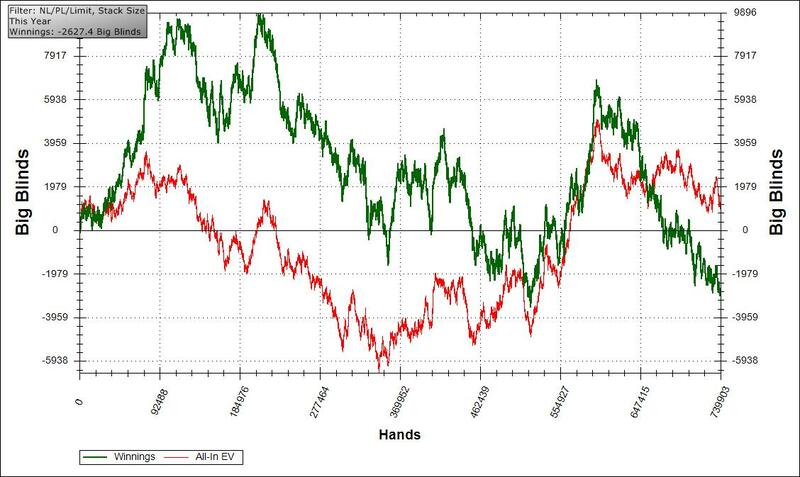 The second, which is thought by a majority of wannabe poker pros (particularly those that believe every poker myth), is that in the long run poker is a skill game. Using the same 1000 players as above, the players that work hardest and are the most intelligent will rise to the top quickly. The players with the best results are the best players and therefore those are the ones that should be deservedly followed. The real issue is that both schools of thought create the same world that we see before us, so neither can be really proved wrong. In fact both have merit, and the truth certainly lies somewhere between the two. 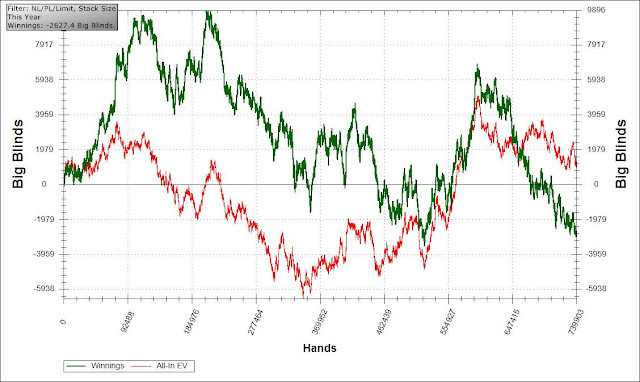 I guess in a round about way what I'm getting to is this: In my opinion so far, in terms of holdem, the second worldview is more important than the first. In terms of omaha, the first worldview is almost as important as the second. 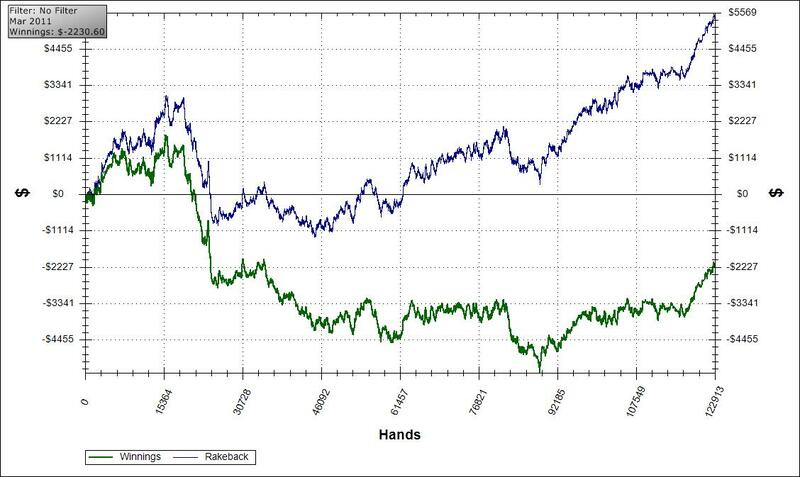 The idea that there are players claiming to be good at the game with less than 500k hands under their belt is pure and utter insanity. 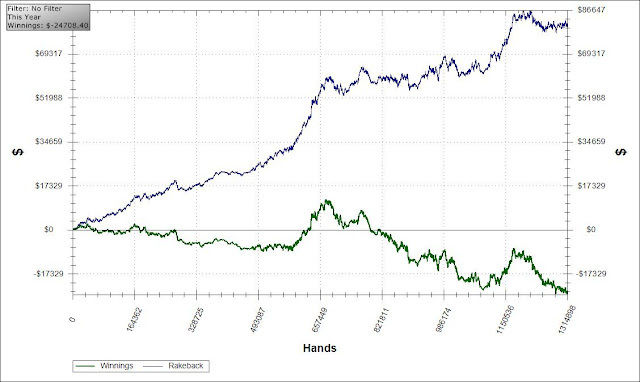 In what I have seen so far, I honestly don't think you can come close to the long run with less than 3m or so hands. My volume went through the roof this past week due to the stars rakeback rewards promo, and I easily got my most vpps any week for the year. In Australian time it's basically a promo where you get prizes based on how many points you can earn between 3pm and 3pm the next day, which is a great time period as it allows you to get a good sleep in and play to the end. It's a 10 day promo, and I've gone for it on the 2nd day where I got 28th for $200, the 4th day I picked up 16th for $250, and the 6th I got 9th for $400. 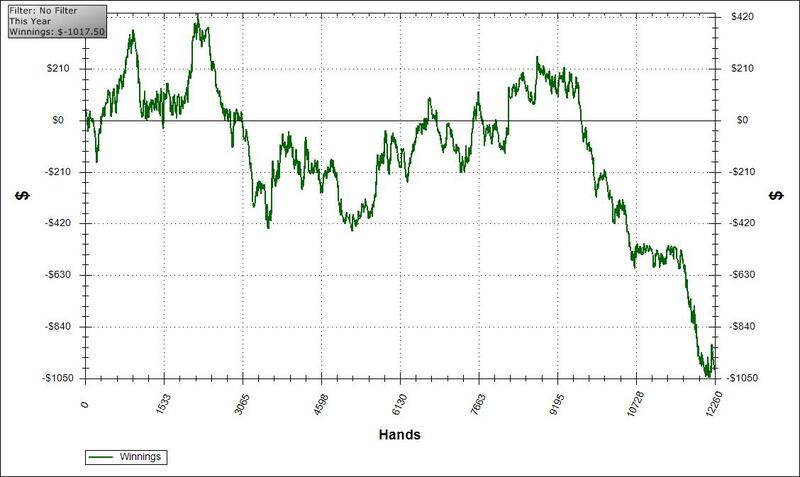 Not a bad showing so far, and I'll be going for it again on the 8th and the 9th so I'm aiming for another $350 total for $1200 overall. My play at the tables has definitely suffered, but not by a big amount, and apart from one big -$3k session I've actually not lost too much over the week. 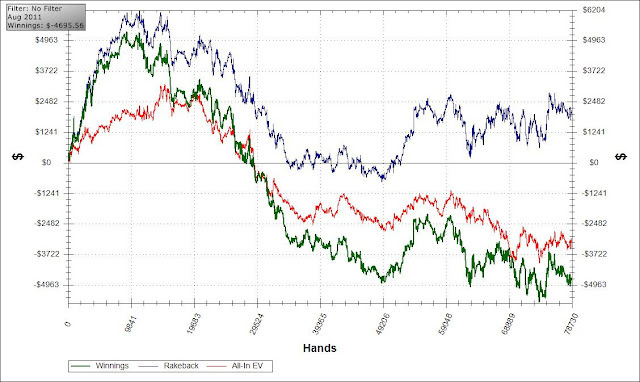 I'm really just trying to push out vpps and get breakeven at the tables til the end of the year, that would be ideal at this point. Dropping $4k last night and today downgraded the past week from epic to just awesome. I kind of knew it would happen too, as I couldn't sleep last night and played tired and probably made a bunch of -ev decisions. Would have been a great day to take off but I could not afford that luxury. 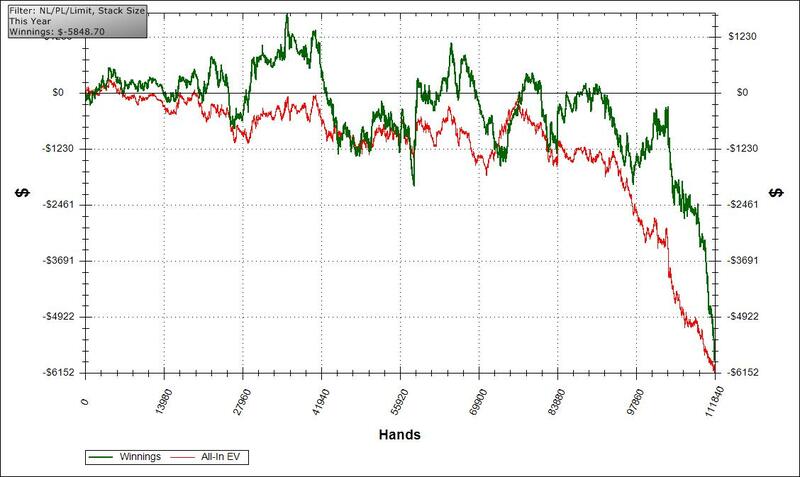 I finally genuinely feel like I'm a winning player at plo though now, and I feel like my recent results are somewhat of a vindication given my whining towards the end of last month about cooler spots. VPP wise, my goal right now is simple. I want to finish SNE by Christmas Eve. I'll be taking the 4th of December off, so removing that day I need to average just a little over 3.8k/day to make my goal happen. I've managed 4k for 6 out of the last 7 days which gives me decent confidence I guess but anything could happen from here really. A promotion starts tomorrow which rewards high grinding but rewards the 100plo level a lot more than the 200plo level, so I may have to drop down if it looks like I could make it to any of the higher prizes.